1Department of Pharmacognosy- Phytochemistry, Faculty of Pharmacy and Science Muhammadiyah Prof.Dr. Hamka University, 1340 Jakarta 16470, INDONESIA. 2Department of Pharmacognosy- Phytochemistry, Faculty of Pharmacy Universitas Indonesia, Depok 16424, West Java, INDONESIA. 3Department of Pharmacology, Faculty of Pharmacy Indonesia University, Depok 16424, West Java, INDONESIA. 4Centre for Chemistry Indonesian Institute of Science, Jakarta, INDONESIA. Introduction: Sterculia rubiginosa Zoll ex.Miq leaves have been used as traditional medicine in Indonesia. There is no report about pharmacognosy and phytochemical study with this plant.Objective: The main aim of this research is to establish pharmacognosy, phytochemical study and antioxidant activity of Sterculia rubiginosa Zoll.ex. Miq. Leaves. The plant used to cure many diseases of Indonesia. Methods: In the present study, pharmacognosy and phytochemical study of plant material were performed as per the Indonesian Herb Pharmacopoeia. Results: Microscopy powder of Sterculia rubiginosa Zoll.ex. Miq. Leaves shows star shape trichoma as a specific fragment. Physicochemical parameters including total ash (17,152 %), acid-insoluble ash (0,922 %), water-soluble extractive (1,610 % w/w), alcohol-soluble extractive (4,524 % w/w), hexane-soluble extractive (4,005 % w/w), and ethyl acetate-soluble extractive (3,160 % w/w) were evaluated. Phytochemical screening of ethanol extracts showed the presence of tannins, flavonoids, alkaloids, steroids-terpenoids, glycosides, and phenols. And absent of saponins and Anthraquinones. Antioxidant activity with IC50 157, 4665 ppm and flavonoid total was 59,436 mg/g quercetin equivalent. Conclusion: The pharmacognosy, physiochemical, and phytochemical evaluation provides information for the safety, identification, and class of chemical constituent’s presents in this crude extract. 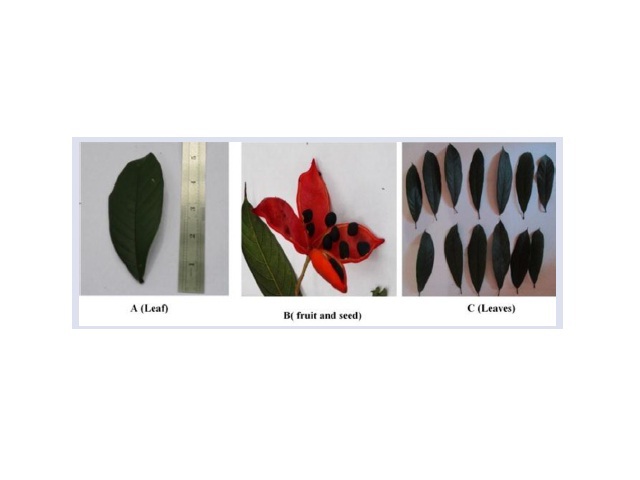 The Macroscopic leaves, fruits and seed of SR.
Prastiwi R, Elya B, Sauriasari R, Hanafi M, Dewanti E. Pharmacognosy, Phytochemical Study and Antioxidant Activity of Sterculia rubiginosa Zoll. Ex Miq. Leaves. Pharmacognosy Journal. 2018;10(3):571-575. Sterculia rubiginosa zoll. ex Miq.